Agriculture is central to the provision of food and the eradication of poverty and hunger. Not only does it provide significant mass and rural employment, it is also a major contributor to national economic growth and a considerable foreign exchange earner for many developing countries. Given the fundamental importance of agriculture to most developing economies, its chronic neglect by many of them has been of utmost concern for some time. However, several factors, which are not mutually exclusive, have resulted in a recent upswing in domestic private and foreign participation in agricultural industries in a significant number of developing countries. Most of these factors are of a structural nature, and are expected to drive agricultural investment in the foreseeable future. In this context foreign participation, as well as domestic investment, can play a critical part in agricultural production in developing countries, boosting productivity and supporting economic development. 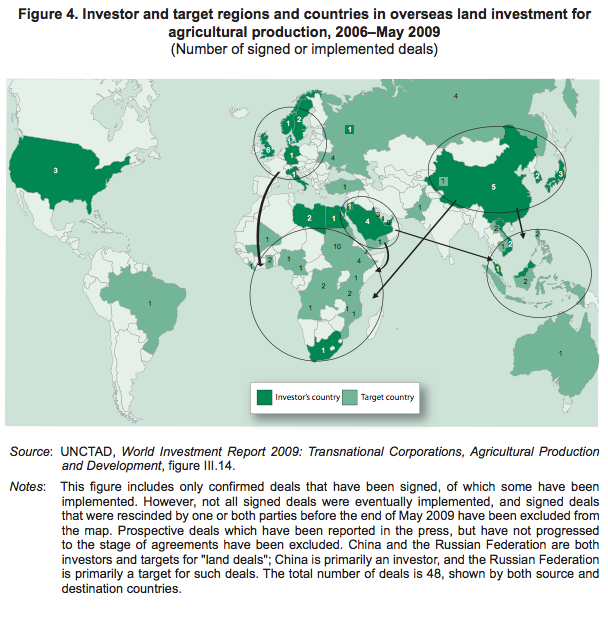 The main drivers of agricultural investment include the availability of land and water in target locations, combined with fast growing demand and rising imports of food crops in various countries, including both the more populous emerging countries, such as Brazil, China, India and the Republic of Korea, and landand water-scarce developing regions, such as member States of the Gulf Cooperation Council (GCC). International demand for agricultural commodities has been further spurred by other factors, such as biofuel initiatives around the world, resulting in a spate of investments in developing countries in the cultivation of sugarcane, grains (such as maize) and oilseeds (such as soya beans), as well as non-food crops such as jatropha. These trends are intertwined with a rapid rise in food prices over the past few years and subsequent shortages in commodities such as rice, which has spawned a number of “new investors”, and also triggered a number of speculative direct investments in agriculture and land. FDI in agriculture is on the rise, although its total size remains limited (inward FDI stock in 2007 was $32 billion) and is small relative to other industries (table 4). At the turn of the 1990s, world FDI flows in agriculture remained less than $1 billion per year, but by 2005–2007, they had tripled to $3 billion annually (table 4). Moreover, TNCs established in downstream segments of host-country value chains (e.g. food processing and supermarkets) also invest in agricultural production and contract farming, thereby multiplying the actual size of their participation in the industry. 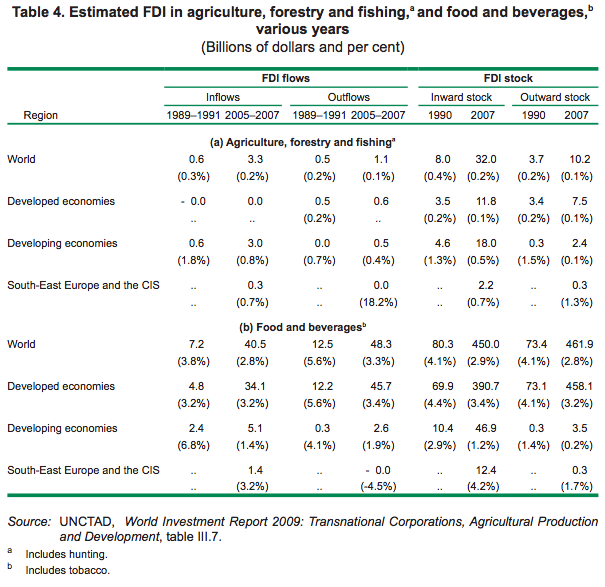 In fact, after a rapid rate of growth in the early 2000s, FDI flows in the food and beverages industry alone (i.e. not including other downstream activities) exceeded $40 billion in 2005–2007 (table 4). Democratic Republic, Malawi, Mozambique and the United Republic of Tanzania, the share of FDI in agriculture in total FDI flows or stocks is relatively large (figure 3). This is also true for some nonLDCs, such as Ecuador, Honduras, Indonesia, Malaysia, Papua New Guinea and Viet Nam. The high share in these countries is due to factors such as the structure of the domestic economy, availability of agricultural land (mostly for long-term lease), and national policies (including promotion of investment in agriculture). FDI is relatively large in certain cash crops such as sugarcane, cut flowers and vegetables. The bulk of inward FDI in developing regions is aimed at food and cash crops. There is also a growing interest in crops for biofuel production through projects related to oil-seed crops in Africa and sugarcane in South America, for instance. In terms of the main produce targeted by foreign investors in developing and transition economies, some regional specialization is apparent. For example, South American countries have attracted FDI in a wide range of products such as wheat, rice, sugarcane, fruits, flowers, soya beans, meat and poultry; while in Central American countries, TNCs have focused mostly on fruits and sugarcane. In Africa, foreign investors have shown a particular interest in staple crops such as rice, wheat and oil crops; but there is also TNC involvement in sugarcane and cotton in Southern Africa, and in floriculture in East Africa. In South Asia, foreign investors have targeted the large-scale production of rice and wheat, while their activities in other Asian regions are concentrated more in cash crops, meat and poultry. Finally, TNCs in the transition economies are largely involved in dairy products, although more recently they are also seeking to invest in wheat and grains. Contract farming is a significant component of TNCs’ participation in agricultural production, in terms of its geographical distribution, intensity of activity at the country level, coverage by commodities and types of TNCs involved. In this context contract farming can be defined as non-equity contractual arrangements entered into by farmers with TNC affiliates (or agents on behalf of TNCs) whereby the former agree to deliver to the latter a quantity of farm outputs at an agreed price, quality standard, delivery date and other specifications. It is an attractive option for TNCs, because it allows better control over product specifications and supply than spot markets. At the same time it is less capital-intensive, less risky and more flexible than land lease or ownership. From the perspectives of farmers, contract farming can provide predictable incomes, access to markets, and TNC support in areas such as credit and know-how. TNCs engaged in contract farming activities and other non-equity forms are spread worldwide in over 110 countries across Africa, Asia and Latin America. For example, in 2008 the food processor Nestlé (Switzerland) had contracts with more than 600,000 farms in over 80 developing and transition economies as direct suppliers of various agricultural commodities. Similarly, Olam (Singapore) has a globally spread contract farming network with approximately 200,000 suppliers in 60 countries (most of them developing countries). Contract farming is not only widespread, but also intensive in many emerging and poorer countries. For instance, in Brazil, 75% of poultry production and 35% of soya bean production are sourced through contract farming, including by TNCs. In Viet Nam the story is similar, with 90% of cotton and fresh milk, 50% of tea and 40% of rice being purchased through farming contracts. In Kenya, about 60% of tea and sugar are produced through this mode. Moreover, contract faming arrangements cover a broad variety of commodities, from livestock through staple food produce to cash crops. For example, Olam sources globally for 17 agricultural commodities (including cashew nuts, cotton, spices, coffee, cocoa and sugar). Similarly, agricultural crops make up two thirds of Unilever’s (United Kingdom/Netherlands) raw materials, and include palm and other edible oils, tea and other infusions, tomatoes, peas and a wide range of other vegetables. These are sourced from 100,000 smallholder farmers and larger farms in developing countries, as well as third-party suppliers. Contractual farming arrangements enable different types of TNCs in the downstream stages of agribusiness value chains, including food manufacturers, biofuel producers, retailers and many others, to secure agricultural inputs from local farmers in different host countries. 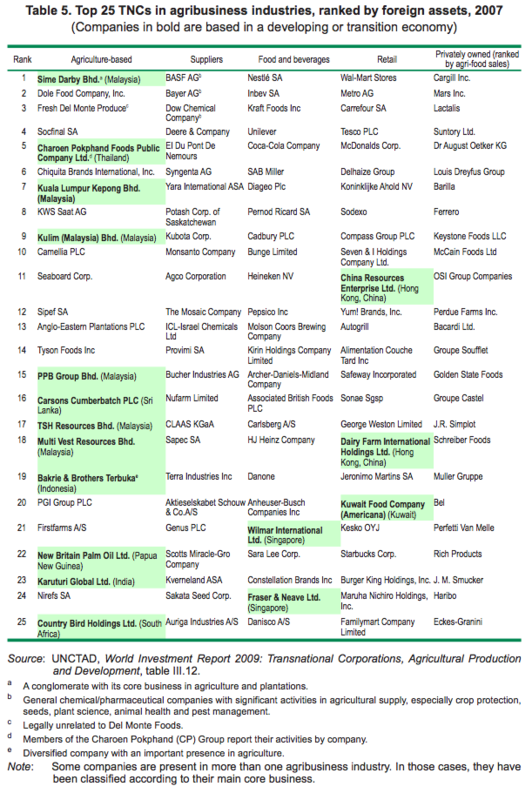 The 25 largest agriculture-based TNCs (i.e. companies which are primarily located in the agricultural production segment of agribusiness, such as farms and plantations) differ from the top agriculture-related TNCs (i.e. those primarily in upstream or downstream stages of these value chains): the former have a significant number of developing-country firms among their ranks, while the latter do not (table 5). In terms of foreign assets, the number of agriculture-based TNCs is split almost evenly between developed and developing-country firms, indicating that firms from developing countries are also emerging as important players in global food and non-food agricultural production. However, developed-country firms still dominate among agriculture-related TNCs. Twelve out of the top 25 agriculture-based TNCs are headquartered in developing countries and 13 in developed countries. Indeed, the top position in the list is occupied by a developing-country TNC, Sime Darby Berhad (Malaysia), while United States firms (Dole Food and Del Monte) occupy the second and third positions (table 5). The universe of agriculture-related TNCs includes food processors/manufacturers, retailers, traders and suppliers of inputs. These TNCs are usually larger than agricultural TNCs. For example, the world’s largest food and beverages TNC, Nestlé (Switzerland), controls $66 billion in foreign assets, and the largest food retailer, Wal-Mart (United States), controls $63 billion. In contrast, the largest agricultural TNC, Sime Darby (Malaysia), has only $5 billion of foreign assets. The list of the largest TNC input suppliers to agriculture comprises only developed-country firms. In food processing, 39 of the top 50 firms are headquartered in developed countries. Compared to other TNCs in agribusiness, those in food and beverages are very large: the nine largest, all headquartered in developed countries, control about $20 billion of foreign assets each; together, they represent more than two thirds of the foreign assets of the top 50 firms. Retailing and supermarket TNCs also play a major role in international agricultural supply chains. The majority of the 25 largest TNCs in this industry (22) are again from developed countries (table 5). Apart from traditional TNCs involved in agriculture, newcomers, such as State-owned enterprises, sovereign wealth funds and international institutions, are increasingly active in agriculture. The main drivers of (or motives for) the new investors are the intertwined twins of threat and opportunity. For example, Agricapital (a State-owned fund based in Bahrain) is investing in food crops overseas to support its government’s food security policies. At the same time, supplying food to the world’s burgeoning markets is seen as a lucrative opportunity by other actors, thereby spurring international investment in agriculture by companies and funds such as Vision 3 (United Arab Emirates) and Goldman Sachs (United States). In addition to commercial investment in agriculture – a common feature of developed- and developing-country TNCs – in the wake of the food crisis, food security has also become a major driver of new investors. These include companies and funds (some Stateowned or backed) from a variety of countries, especially the Republic of Korea and GCC countries. To varying degrees, the governments of these source countries have decided that investment in target host countries, giving them control over crop production and export of the output back to their home economy, is the most effective way of ensuring food security for their populations. For many of these countries, the most crucial factor or driver behind outward FDI in agriculture is not land per se, but rather the availability of water resources to irrigate the land. Most of their investment is in other developing countries. The scale of South-South FDI driven by food security concerns is not easy to determine because many relevant deals have only recently been signed, although others are being considered or in negotiation. Of the definite larger scale investments involving land acquisitions (i.e. outright ownership and long-term leases) undertaken thus far, the largest investing countries from the South include Bahrain, China, Qatar, Kuwait, the Libyan Arab Jamahiriya, Saudi Arabia, the Republic of Korea and the United Arab Emirates. The most important developing host countries are in Africa, with Ethiopia, Sudan and the United Republic of Tanzania among the foremost FDI recipients (figure 4). A precisely quantified evaluation of the impact of TNC involvement in agriculture on important development aspects, such as contribution to capital formation, technology transfer and foreign market access, is impeded by the limited availability of relevant hard data collected by national authorities or available from international sources. The actual impacts and implications vary enormously across countries and by types of agricultural produce. In addition, they are influenced by a range of factors, including the type of TNC involvement, the institutional environment and the level of development of the host country. A number of salient observations of TNCs’ involvement in agriculture for developing countries nevertheless emerge. Overall, TNC involvement in developing countries has promoted the commercialization and modernization of agriculture. TNCs are by no means the only – and seldom the main – agent driving this process, but they have played an important role in a significant number of countries. They have done so not only by investing directly in agricultural production, but also through nonequity forms of involvement in agriculture, mostly contract farming. Indeed, non-equity forms of participation have been on the rise in recent years. In many cases, they have led to significant transfers of skills, know-how and methods of production, facilitated access to credit and various inputs, and given access to markets to a very large number of small farmers previously involved mostly in subsistence farming. Although TNC involvement in agriculture has contributed to enhanced productivity and increased output in a number of developing countries, there is lack of evidence on the extent to which their involvement has allowed the developing world to increase its production of staple foods and improve food security. Available evidence points to TNCs being mostly involved in cash crops (except for the recent rise of South-South FDI in this area). Such a finding reveals the development challenges for developing countries in promoting TNC participation in their agricultural industry to improve food security. However, food security is not just about food supply. TNCs can also have an impact on food access, stability of supply and food utilization and, in the longer run, their impacts on these aspects of food security are likely to prove more important for host economies. Positive impacts of TNC involvement in agriculture are not gained automatically by developing countries. While TNCs have at times generated employment and improved earnings in rural communities, no clear trend is discernible. To the extent that TNCs promote modernization of agriculture and a shift from subsistence to commercial farming, their long-term impact is likely to accelerate the long-term reduction in farm employment while raising earnings. Only a limited number of developing countries have also been able to benefit from transfers of technologies. In particular, the R&D and technological innovations of the large TNCs are typically not geared towards the staple foods produced in many developing countries. Apart from the potentially large benefits that developing countries can derive from TNC participation in their agriculture, past experiences and evidence indicate that governments need to be sensitive to the negative impacts that can arise. A particular concern is that of the asymmetry in the relationship between small farmers and a restricted number of large buyers, which raises serious competition issues. Recent experiences also underscore that developing-country governments need to be aware of the environmental and social consequences of TNCs involvement in agriculture, even though there is no clear and definite pattern of impact. Case studies show that TNCs have the potential to bring environmentally sound production technologies, but their implication in extensive farming has also raised concerns, together with their impact on biodiversity and water usage. Similarly, TNCs’ involvement raises significant social and political issues whenever they own or control large tracts of agricultural land. The expansion of agricultural production is vital for developing countries, both to meet rising food needs and to revitalize the sector. Therefore, policymakers need to promote more investment in this sector, both private and public, and domestic and foreign. Given the financial and technological constraints in many developing countries, policymakers should devise strategies for agricultural development and consider what role TNCs could play in implementing them. The challenge is considerable, as agriculture is a sensitive industry. There is a need to reflect the interests of all stakeholders, especially local farmers, and include them, as far as possible, in the policy deliberation and formulation process. The key challenge for policymakers in developing countries is to ensure that TNC involvement in agricultural production generates development benefits. Both FDI and contractual arrangements between TNCs and local farmers can bring specific benefits to the host country, such as transfer of technology, employment creation and upgrading the capacities of local farmers, together with higher productivity and competitiveness. Therefore, policies need to be designed with a view to maximizing these benefits. It is equally important for policymakers to address social and environmental concerns with regard to TNC involvement. Social and environmental impacts need to be assessed carefully, and particular attention paid to possible implications for domestic agricultural development and food security in the long run. Negotiations with foreign investors should be transparent with regard to the land involved and the purpose of production, and local landholders should be encouraged to participate in the process. Policies should be designed to protect traditional land tenure rights of local farmers in order to avoid abuses of what might be considered underutilized or underdeveloped land, and to make possible local farmers’ access to courts in case of dispossession. Care needs to be taken to secure the right to food for the domestic population and to protect the rights of indigenous peoples. Numerous developing countries have started to actively encourage FDI in agricultural production. A survey jointly undertaken by UNCTAD and the World Association of Investment Promotion Agencies (WAIPA) on the role of investment promotion agencies (IPAs) in attracting FDI in agricultural production revealed that the majority of respondents, in particular those in developing countries, promote FDI in this sector. Moreover, these respondents anticipate a still greater role for FDI in this area in the future. TNCs are mainly expected to make new technologies, finance and inputs available to the sector and to improve access to foreign markets for cash crops. Overall, developing countries are relatively open to TNC involvement in agricultural production, although there are considerable differences between individual countries based on cultural, socio-economic and security-related considerations. The most frequently found restriction for foreign investment in agricultural production relates to land ownership, but in many cases foreign investors are allowed to lease land. Aside from promoting FDI in agricultural production, host countries should pay particular attention to promoting contractual arrangements between TNCs and local farmers, such as contract farming, which would enable the latter to enhance their capacities and become part of national or international food value chains. However, in pursuing such strategies host countries should be aware that, in general, TNCs are more interested in contractual arrangements concerning the production of cash crops. This means that promoting contract farming for alleviating the food crisis remains a big challenge. In this context, governments should address the specific obstacles to efficient cooperation between TNCs and local farmers, such as (1) lack of capacity of smallholders to supply products in a consistent and standardized manner; (2) lack of availability of adequate technology; (3) lack of capital; (4) remoteness of production and capacity for timely delivery; (5) limited role of farmer organizations; and (6) lack of adequate legal instruments for dispute settlement. Various policy options exist for tackling these bottlenecks. Among them are education and training programmes for local farmers, the provision of government-led extension services, the establishment of standards and certification procedures, the granting of financial aid, matchmaking services to connect local farmers to TNCs, support for the establishment of farmer organizations, and improving the domestic court systems to increase legal security. Governments could also consider the development of model contracts to protect the interests of farmers in negotiating with TNCs. Notwithstanding some reservations about FDI in agricultural production, host countries should not underestimate the potential of this form of TNC involvement for enhancing development objectives. In particular, in light of the recent interest in outward FDI to secure domestic food supply there is potential for host countries to benefit from such investment for their own staple food needs, provided that the amount of production is shared between home and host countries. The challenge for host countries is to match inward FDI with existing domestic resources, such as abundant labour and available land, and to create positive synergies to promote long-term agricultural development and increase food security. Key instruments for maximizing the contribution of FDI to sustainable agricultural and rural development are the domestic legislative framework and, especially as far as major land acquisitions are involved, investment contracts between the host government and foreign investors. These contracts should be designed in such a way as to ensure that benefits for host countries and smallholders are maximized. Critical issues to be considered include, in particular, (1) entry regulations for TNCs, (2) the creation of employment opportunities, (3) transfer of technology and R&D, (4) welfare of local farmers and communities, (5) production sharing, (6) distribution of revenues, (7) local procurement of inputs, (8) requirements of target markets, (9) development of agriculture-related infrastructure, and (10) environmental protection. To ensure food security in host countries as a result of FDI in staple food production by “new” investors, home and host countries could consider output-sharing arrangements. Before concluding an investment contract with foreign investors, governments should conduct an environmental and social impact assessment of the specific project. After the investment has been made, monitoring and evaluating its impact on the host country’s overall development process is critical. IIAs can be an additional means to promote TNC participation in agricultural production, but careful formulation is crucial with a view to striking a proper balance between the obligations to protect and promote foreign investment, on the one hand, and policy space for the right to regulate, on the other hand. This is particularly important in the case of agriculture, as the sector is highly regulated and sensitive, and government agricultural policies may be controversial and subject to change. There are several other policy areas relating to a broader economic agenda that are determinants for TNC participation in agricultural production and their development impact in the host country. These therefore should be integrated into host-country strategies aimed at attracting TNCs to agricultural production. Among them are those related to infrastructure development, competition, trade and R&D. Infrastructure development is critical as a means of trade facilitation for agricultural goods. This includes improving existing transportation systems, investing in trade facilitation, providing sufficient post-harvest storage facilities and renovating outdated water irrigation infrastructure. Given the high costs involved and the limited ODA available, policymakers may wish to require TNCs to contribute to infrastructure development when permitting largescale projects. Since farmers are generally the weakest link in the supply chain, competition policy can play a vital role in protecting them against potential abuses arising from the dominant position enjoyed by TNCs. Tariffs and non-tariff barriers as well as subsidies may substantially influence TNC involvement in agricultural production. These kinds of policy measures in developed countries could discourage investment and contract farming in developing countries where the subsidizing country and the potential developing host country produce identical agricultural products or close substitutes. 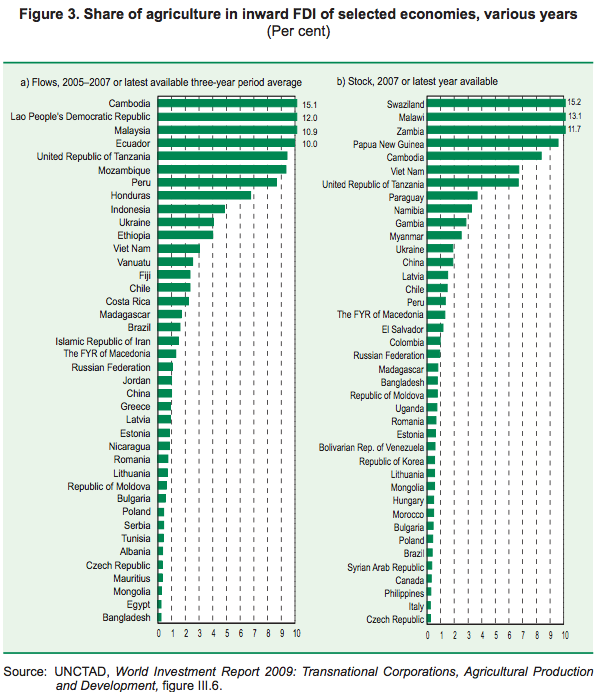 Reducing subsidies in developed countries could encourage FDI to poor countries. Economies of scale is another challenge, particularly for small developing countries. In their case, regional integration can be an important instrument in making them more attractive for TNCs involved in agricultural production and exports. Host countries should also consider the role of R&D activities and intellectual property rights for increasing agricultural production and adapting the development of seeds and agricultural products to local and regional conditions. Policies should aim at domestic capacity-building to develop strong counterparts to TNCs in the host country – private or public. In this regard, public-private partnerships (PPPs) for R&D can serve as models for fostering innovation, for adapting the development of seeds and products to local and regional conditions, for making agricultural R&D more responsive to the needs of smallholders and to the challenges of sustainability, for reducing costs, and for mitigating the commercial and financial risks of the venture through risk-sharing between the partners. In the wake of recent food price hikes and export restrictions by agricultural exporter countries, some food-importing countries have established policies aimed at the development of overseas food sources for their domestic food security. Despite some concerns that these policies may aggravate food shortage in host countries, they have the potential for increasing global food production and mitigating food shortages in both home and host developing countries. Past attempts by some governments to invest in overseas agriculture have not always met their expectations. Indeed, there are lessons to be learnt. In addition to outward FDI, home countries could consider whether overseas food production in the form of contract farming may be a viable and less controversial alternative to FDI. Besides focusing on agricultural production itself, another option is to invest in trading houses and in logistical infrastructure such as ports. Agriculture and food security have gained considerable importance on the international policy agenda, both at the multilateral and regional level. A major development was the establishment of the United Nations High-Level Task Force on the Global Food Security Crisis (HLTF) in April 2008. The aim of the HLTF was to create a prioritized plan of action for addressing the global food crisis and coordinate its implementation. The HLTF thus developed the Comprehensive Framework for Action (CFA) – a framework for setting out the joint position of HLTF members on proposed actions to address the current threats and opportunities resulting from food price rises; create policy changes to avoid future food crises, and contribute to country, regional and global food and nutritional security. A number of initiatives to boost agricultural productivity have also been taken at the regional level, including the Comprehensive Africa Agriculture Development Programme (CAADP) under the New Partnership for Africa’s Development (NEPAD). The G-8 Summit in L’Aquila, Italy, in July 2009 made a commitment to mobilizing $20 billion over the next three years for a comprehensive strategy for sustainable global food security and for advancing by end 2009 the implementation of a Global Partnership for Agriculture and Food Security. When deciding how to make best use of these new ODA funds, consideration could be given to agricultural development strategies that combine public investments with maximizing benefits from TNC involvement. With regard to possible future international initiatives, consideration should be given to developing a set of core principles concerning major land acquisitions, including rules on transparency, respect for existing land rights, the right to food, protection of indigenous peoples and social and environmental sustainability. TNC participation in agriculture in developing countries through FDI, contract farming and other forms has helped a number of pioneering countries, including Brazil, China, Kenya and Viet Nam, meet the challenge of boosting investment in their agriculture, thereby making the industry a lynchpin for economic development and modernization. The route has not been easy, with costs and benefits arising from TNC involvement. For most developing countries many development challenges still remain in the quest for agricultural development, food security and modernization. Among these challenges is how to build and reinforce domestic, regional and international value chains, as well as harness technology in agriculture. It is clear that for LDCs and other poor countries, in Africa and elsewhere, a “new green revolution” is urgent, and an essential question to ask is whether TNCs can play a role in its fulfilment. This year’s World Investment Report reveals a real and rising interest by TNCs – from the South as well as the North – for investment in developing countries’ agricultural industries. Moreover, a large proportion of this interest is in poorer regions, such as Africa. TNCs vary along the value chain, but overall they have the technological and other assets available to support developing countries’ strategies towards intensifying take-up of the green revolution. The Report also demonstrates examples of this occurring through partnerships and alliances with farmers, public research entities and others. More needs to be done, but the building blocks are in place for striking a new “grand bargain” to harness the green revolution in the service of Africa’s poor and hungry, as well as the wider objectives of development. Central to this programme are, first, investing in trade and investment facilitation and, secondly, creating institutional arrangements such as PPPs to advance the green revolution in the region by encouraging and boosting critical flows of capital, information, knowledge and skills from partners to the countryside. An important initiative in this regard would be the establishment of seed and technology centres in the form of PPPs, mandated with the task of fostering channels to adapt relevant seed and farming technologies to make them suitable to local conditions, distributing seeds to farmers, and, in the longer term, building and deepening indigenous capacity.